Mumbai: 36-year-old Eman Ahmed, one of the heaviest women in the world, today landed here for weight reduction treatment at a local facility. Eman, who travelled to India in an Egypt Air plane, landed at Mumbai international airport around 4 am. Eman, who has not moved out of her house for 25 years, would be under observation for about a month before she undergoes surgery, doctors said. 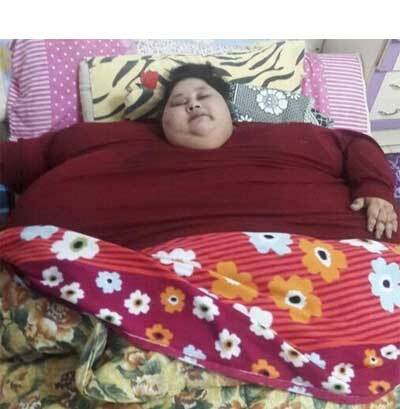 One of the heaviest women in the world, she is currently under the care of a city-based bariatric surgeon Muffazal Lakdawala, and his team of doctors. They have been treating Eman for almost three months and took all the necessary precautions needed for the transportation of bed-bound Eman from Egypt’s Alexandria city, an aide to Lakdawala said. “Even though transporting Eman to Mumbai was a challenging task keeping in mind the complexities of her case as she is a high risk patient who has not been able to move or leave the house for the past 25 years,” doctors said. A special bed was created by local Egyptian artisans in requirements with the safety precautions as laid out by the Egypt Air for her safe transport on ground and in the plane.